Hyundai Steel had cut hot-rolled coil prices by 14 percent in its first price reduction of the benchmark product in eight months due to weak demand. Hyundai Steel, South Korea's second-largest steel firm, said on Wednesday it had cut hot-rolled coil prices by 14 percent in its first price reduction of the benchmark product in eight months due to weak demand. 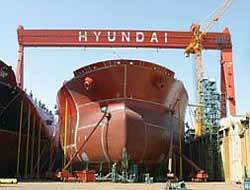 Hyundai said the price of the flat steel product, which accounts for around one-fourth of its total output, was lowered to 880,000 won ($620) a tonne this month from the previous 1.02 million won. Hyundai, which mainly makes construction steel such as rebar, H-beam and section, last lowered prices of long products by around 20 percent in November and December due to faltering demand. South Korea's construction sector has been heavily hit by the slowing economy, with building permits awarded in January plunging 48 percent in terms of space to 4.49 million square metres. Steelmakers across the world have been cutting production as prices continue to fall after hitting record highs early last year, as the financial crisis grew into a broad recession that has already engulfed the United States and much of Europe, dampening steel demand. In China, prices of benchmark hot-rolled coil fell 4 percent last week, dropping for a fifth consecutive week, to around 3,345 yuan ($489.4) a tonne, and analysts expect prices to go down further due to slow inventory run-down. For a factbox on global steel price forecasts, click on Japan said on Wednesday its February crude steel output fell a record 44 percent to hit the lowest in 41 years. In South Korea, Dongkuk Steel cut ship plate prices by 21 percent earlier this month and POSCO, the world's No.4 steelmaker, has said it would adjust prices after concluding annual iron ore negotiations, which analysts see resulting in a price drop of around 30-40 percent after six years of consecutive gains.